St. Augustine grass (also known as Charleston grass in South Carolina) is often the most popular choice for lawns throughout southern United States. Especially in coastal regions where cold temperature extremes are moderated by oceanic climatic conditions. St. Augustine grass is native to the Caribbean, Africa and Mediterranean regions, and best adapted to subtropical climates. Good for coastal regions, thrives in heat, does poorly in cool climates. Excellent to fair under drought conditions. Moderately good to heavy traffic. Somewhat shade tolerant. Can be used in moist, semi-fertile soils. At the moment, most common installation method is sodding or plugs; seeds are very difficult to obtain if not impossible. HIGHLIGHTS: St. Augustine grass is a big thatch producer, more so than other types of turf grass. It also requires plenty of moisture and is best suited to humid regions. Has good shade tolerance, except for Floratam. Susceptible to fungal diseases. St. Augustine Grass Decline is a virus common to Texas and Louisiana and there is no known control. Mowing Height: 2" — 4"
WARNING: an ingredient in many weed/feed products (2,4-D) designed for cool-season grasses, Bermuda and Bahiagrass, can kill St. Augustine grass. Trees alter conditions by moderating temperatures, leveling out the highs and lows, decreasing wind, increasing humidity and intensifying competition for water and nutrients. As a result, turf experiences reduced shoot density, more upright growth, increased plant height, decreased root depth and thinner leaves and cell walls, causing fewer carbohydrates to develop in the cell walls, reducing photosynthesis and transpiration rates and making them more susceptible to disease. In other words, grass doesn't do too good under trees. Many of the semi-dwarf types have excellent shade tolerance relative to the coarse-type St. Augustine grasses and other warm-season grasses. We also know that the semi-dwarf varieties do not possess chinch bug resistance, and those planting this grass will need to use insecticides to control infestations when they occur. Palmetto grass is the new kid on the block. It is available as plugs or sod. Results are encouraging. There has been anecdotal claims for deep rooting capabilities and its ability to establish itself quickly even under adverse conditions. Palmetto grass was discovered and developed on a sod farm near Daytona Beach, Florida. The cultivar has been tested under "real life" conditions on the sod farm and in practical homeowner situations. Palmetto is not a miracle grass, but the combination of characteristics demonstrated is unequaled. The most notable attribute when examining a field or plot of Palmetto grass is it's deep, vivid color and soft texture. Its visual appeal alone makes it a superior choice compared to other strains available. Palmetto has proved to be exceptional both sun and shade. Often in designing a landscape, a grass is required that will thrive in both full sun and shade. This problem becomes more exaggerated as landscapes mature, and shady areas increase when trees grow larger. Palmetto grass is the most versatile St. Augustine grass available to address these changing needs. 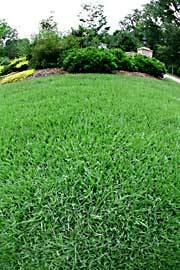 Cold snaps can severely damage or kill Raleigh St. Augustine Grass. Palmetto grass has withstood temperatures near 5 degrees F. in South Carolina, Georgia, and Texas with no significant damage. In Jacksonville, Florida and Charleston, South Carolina Palmetto grass has remained green in areas where other St. Augustine lawns have gone dormant. Palmetto grass remained green in the Tampa Bay, Florida area after two nights of heavy frosts. Floratam and Raleigh St. Augustine both sustained significant browning out damage in the same area. Another important characteristic of Palmetto grass is its deep, massive root system. Once established, this could help reduce watering. In addition, this root system causes Palmetto to transplant well, and establish quickly. It is often desirable to plant a landscape that gives the appearance of a mature lawn shortly after installing. 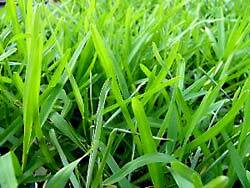 St. Augustine grass , like most turf grasses, has certain cultural and pest problems. It does not remain green during drought conditions without supplemental irrigation. It produces excessive thatch under moderate to high fertility and frequent irrigation. It has poor wear tolerance and some varieties are susceptible to cold damage. The coarse leaf texture is objectionable to some people. The major insect pest of St. Augustine grass is the chinch bug , although resistance to chinch bugs varies somewhat among cultivars. For example, Floratam and Floralawn have traditionally been considered chinch bug resistant, but over time the insect has overcome this and are now considered a pest to these cultivars as well. St. Augustine Decline Virus (SADV) is a major disease problem in some parts of the United States but has not been identified as a problem in Florida. Some cultivars are also susceptible to gray leaf spot disease.